Subdomain URL and SSL for Google Apps are actually not Subdomain URL but CNAME. Here is the guide with the advantages and disadvantages of using custom URL. In the previous article on Google Apps Settings Including Settings for Premium Google+ we wrote that, we are not not one important feature and this the feature we were talking about – Subdomain URL and SSL for Google Apps. Again, Subdomain URL and SSL for Google Apps is not the right terminology, it should be CNAME and SSL for Google Apps, but most common users thinks the CNAME as subdomain due to the same look. If your main website is not having Wild Card SSL (Read about EV SSL certificate), then you can not use the HTTPS URL to login as simply with CNAME you can not change the Protocol. A 443 port is being opened as Port 80. So it is actually becoming some what risky. It is better not to use for core applications, you can use for App Engine for example. At least you need self signed certificate with Open SSL for the whole server hosting the domain, then redirect all https to http using .htaccess and forcing reversely https url of that subdomain looking URL (actually CNAME). This is all about Subdomain URL and SSL for Google Apps. This Article Has Been Shared 7528 Times! 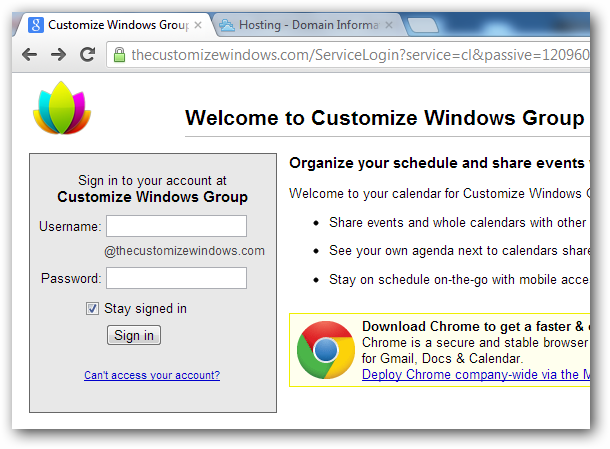 Cite this article as: Abhishek Ghosh, "Subdomain URL and SSL for Google Apps," in The Customize Windows, October 22, 2012, April 23, 2019, https://thecustomizewindows.com/2012/10/subdomain-url-and-ssl-for-google-apps/.